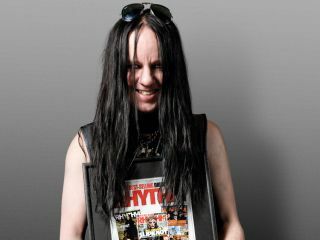 From the pain of losing Slipknot bandmate Paul gray to the joys of reuniting with Murderdolls, backing for Rob Zombie and being voted the best drummer of the last 25 years in Rhythm's massive 25th anniversary poll, it really has been quite a 2010 for Joey Jordison. "Well it kind of feels like a new beginning for us. Me and Wednesday [13, Murderdolls frontman] did the first record, Beyond The Valley Of The Murderdolls back in 2002, so it was a long time ago. And obviously in the interim I had to go back to Slipknot, so coming back to Murderdolls now gave us a chance to really start over." "This album is heavier and a bit darker I guess and where the first was recorded almost like a demo, for fun, this time we had more of an idea of where we wanted to go with it." "I did, and it was a blast. We had Mick Mars [Mötley crüe] play guitar on Drug Me To Hell and Blood Stained Valentine, otherwise all the guitars are me or Wednesday and I played drums. It's such a personal project that it came together real quick in the studio. Homicide Drive was the first song we sat down and wrote - literally the first time me and Wednesday got together after six years. And the drum track on the record is the very first take of that song, start to finish. It was real spontaneous." You can read the full interview with exclusive pictures of Joey's current Pearl Reference Series kit plus the usual array of gear reviews, tips and buyers' guides, in the latest issue of Rhythm magazine, available now. Or subscribe to Rhythm and save up to 35% on the cover price.